Still on vacation in Hawaii, hanging with Mombot and her side of the family over here! Loads of fun and sun, with an update coming soon with pics and stuff. For other updates, check my Twitter or Facebook feeds. ha! “Carmaheaven” was pretty much what it was, Tiana – at least as long as you stayed away from the 405. Actually, even the 405 itself was smooth sailing (north of the 101, anyway; don’t know how it was south of the 10). I had to get from Santa Clarita to Sherman Oaks Saturday morning, and was dreading traffic and had intended to maybe get off at Van Nuys or something… but traffic was clear enough I decided to risk it and stay on a little longer… and it turned out to stay clear all the way to the 101. I guess if I’d needed to get to Westwood or Santa Monica that weekend it would have required some inconvenient circumvagations, but since all the places I had to go were in Hollywood or the Valley, I had no problems with traffic at all. Which wasn’t at all what I was expecting, but was certainly a pleasant surprise. Hope your enjoying yourself in Hawaii Jeff! i wish L.A. had some good public transportation to my office, Kaze – would love to spend the time it takes me to get to work, playing some Zelda or Pokemon instead. Yeah… public transportation definitely has its advantages. I can read on the way, it comes out cheaper in the long term than paying for gas, and I just don’t like driving. But depending on where you have to go, in L.A. it may not be an option. I used to live near Hollywood and Highland, and taking the Red Line from there to downtown, for instance, was simple. But I currently live kind of on the outskirts of the L.A. area (Santa Clarita), and public transportation from here is less of an option. It exists, and for a few months while my car’s transmission was shot and I couldn’t afford to get it fixed, I had to rely on it, but it required numerous transfers, the buses between L.A. and Santa Clarita were very infrequent, and, worst of all, they only ran till about 9 at night — so if I was in L.A. later than that, I had no way home. (Which happened several times for evening shoots or other causes; I had to pass the night in a 24-hour coffee shop a few times waiting until the buses started running again in the morning.) So I’m glad I managed to get my car fixed… but I’m looking forward to moving back to the valley or somewhere else more centrally located so I don’t have to rely on my car so much. Good to know your enjoying yourself 😛 If haven’t already, maybe you should set up a buffer of comics for yourself so you can maximise the vacationess out of your vacation? someday i’ll get a buffer of strips going, Kaze. someday. Carmagedon is an old vehicular combat video game. “Carmageddon” was the name the press gave to the projected traffic nightmare due to the closure of an important part of a major freeway in L.A. last weekend during construction. As it turned out, though, despite the freeway closure traffic was very light all weekend — probably because a lot of people dreading “Carmageddon” left town for the weekend or stayed home. Gooooood Morning Jefboteers and Newbots! JEFF don’t forget the sunscreen! Comic is too funny! I am enjoying the summer traffic here in Tampa cause it only takes me 15 minutes to get to work right now. Give it a few weeks and it really will be Carmageddon! It’s like people forget HOW to drive. Again I love the use of blurring in the last panel. Really makes the foreground pop out at us. Hope you are having tons of fun. Tell Mombot I said Hello! ooh, yeah. i remember, T. wish i had remembered before i forgot those sunscreen-free spots on my calves! missed the sunscreen on the back of my calves and had to sit out surfing for a couple days. but after much applied aspercreme and lanacane, i’m back in business, Pixie! Give me a Xanax and someone to drive me, and I’m good…traffic be damned!! That’s why I will avoid as many cities when traveling as humanly possible. 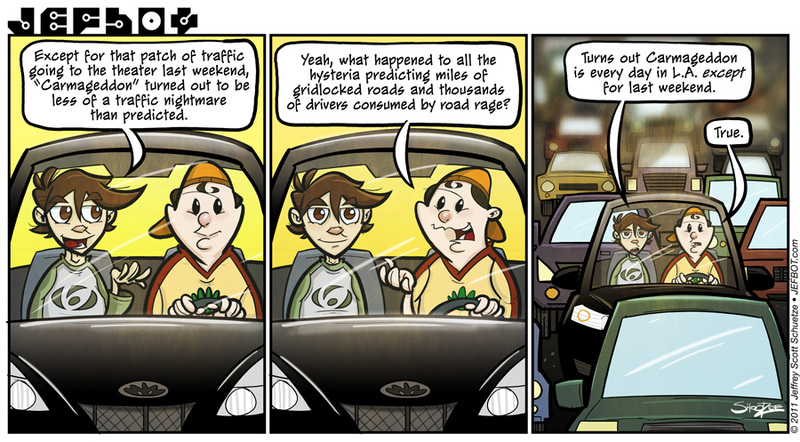 I’m glad I don’t live near enough to a big city that I encounter traffic, at least not when I’m driving. Same here. Fortunately I also live in a part of town where just about everything is within a five to fifteen minute drive depending on traffic. HA-HA! Just goes to show that that which we fear may not be what is bad for us. And its true the other way around as well. Love the TV NEWS commentatory feel of the first two pannels. As for Carmagedon, I had the zombie free version. Loads of fun. Three things. One, you really need to pay more attention to the comic and the paragraph directly under it. Two, another Star Wars thing and Kinect crap ,big whoop. Three, I don’t think Jeff has even touched his Xbox since he moved. big tough guy just cause your on the internet huh? Grow up there is freedom of speech and i just made a comment about something that would interesting to see from his perspective in a comic. I’ll just be ignoring you now. My usual commute is twenty minutes, but they’re doing construction work on the bridge I usually take over the river. If I take the bridge, it’s a guaranteed forty minutes of jackrabbitting and road rage. But it’s a fifty minute trip if I go for the next bridge over . . . I hope you are having a great time in HI! Have some butter mochi for me. Mmmmmm. I probably wouldn’t be able to stand living in any large city or even in the down town area of a small city like mine. Just too much going on all the time for my liking. it’s gonna be hard going back to L.A. after living with the slower pace of Hawaii, Fijiman, i can tell you that much. I wish I’d gone out. I was too scared.